This recipe says "summer" to me. It uses zucchini and bell pepper, it is fast and easy, it is cooked on the stovetop and not baked, it is light and healthy. . . it's a perfect summer dish. 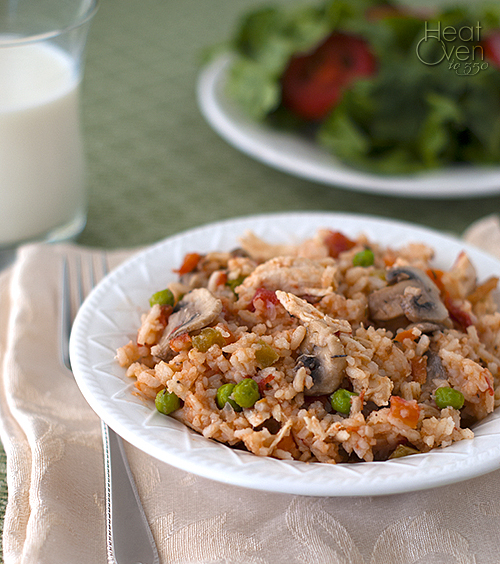 I love the Southwestern flair it has, and I love that it uses leftover brown (or regular) rice. I always love finding new, different ways to use zucchini and this one is the winner of the season. The zucchini is wonderfully crisp-tender in it and its flavor isn't completely masked by the other ingredients. If you have an abundance of fresh tomatoes in your garden, this dish is even better using diced fresh tomatoes instead of the canned tomatoes. Cook up a batch, eat out on the patio, and taste summer. Heat oil in a large, ovenproof skillet over medium heat. Add zucchini, bell pepper, onion and a pinch of salt and cook, stirring occasionally, for 5 minutes. Stir in garlic and red pepper flakes and cook and stir an additional minute. 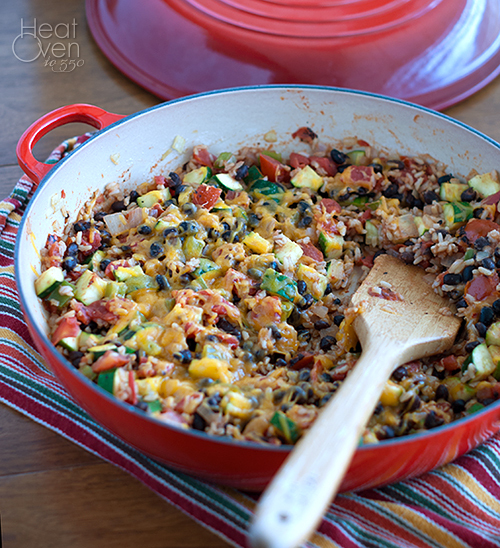 Add black beans, undrained tomatoes, water and cooked rice to the skillet. Cook, stirring occasionally, until heated through, about 2-3 minutes. Season to taste with salt and pepper. Remove skillet from heat and sprinkle cheese on top. Broil 2-3 minutes or until cheese has melted. Serve. 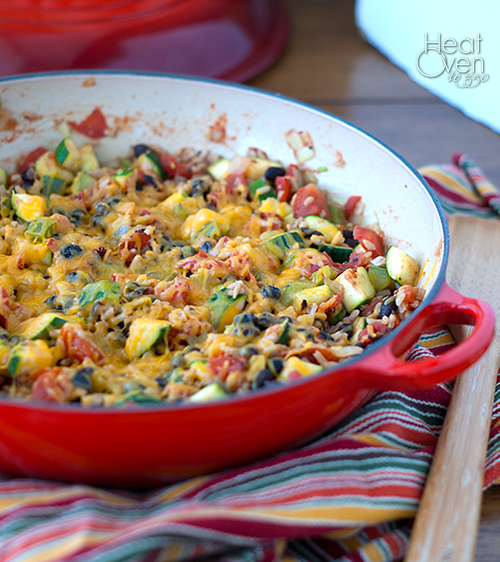 This looks incredible, so tasty :) I love easy one-pot dinners like this - especially Mexican ones!! Looks like a great one-dish meal! I love it. This sounds like a great satisfying meatless dinner! Love it! I think I could make a mean dent into that dish with a bunch of tortilla chips for dipping and a bottle of hot sauce - yum! Just checking in to see how everything is going - summer went by quick, huh?! Could you just use adobo sauce without the chipotle peppers? If so, how much would it take? This looks amazing. Beautiful idea and the second pic of the bread was amazing. I have got to try this. How much peanut butter flavor came through in the bread? It is strongly peanut butter flavored but not dripping with melted peanut butter, if that makes sense.